...and fussy cut the lamb for the center. =) This wall hanging will be going up in my sewing room. It measures 29"x31". This was my "test" piece, to see if I would like making hexagons and the hand sewing it involves. I am getting ready to start a larger project. 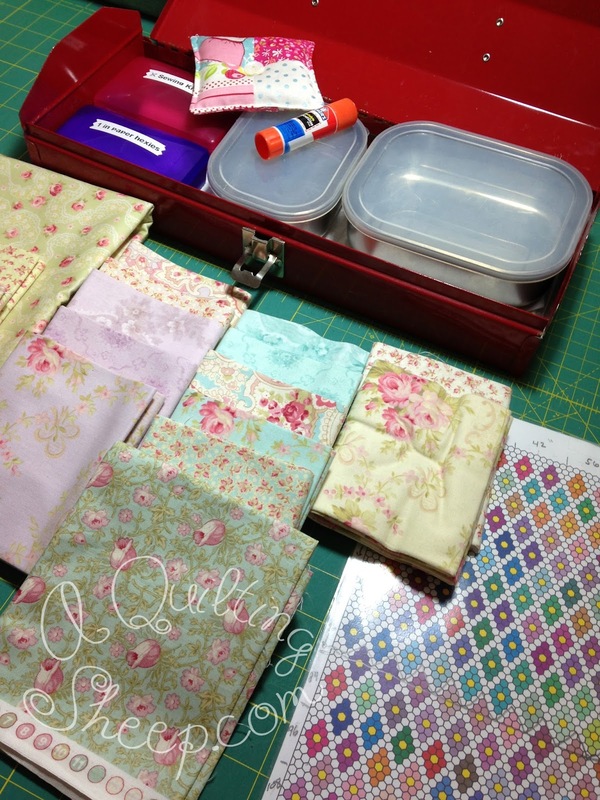 I have my sewing kit all set up and I am auditioning fabric. The free pattern I am going to follow can be found at Paper Pieces. 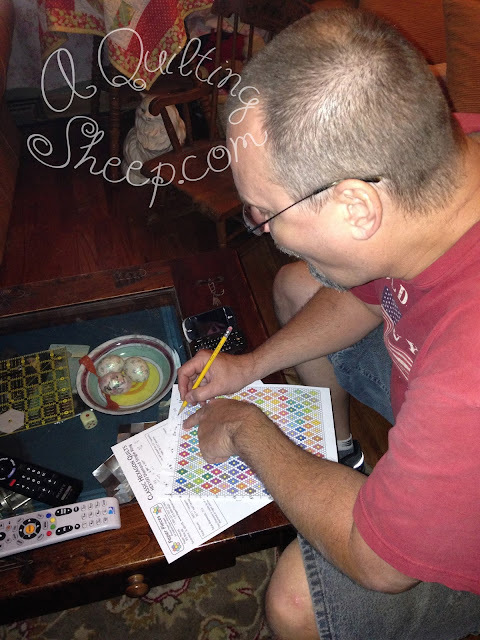 I am not ambitious enough to make a queen size quilt that the pattern is written for, so my math man helped me figure out how many diamonds I would need to for a 60"x70"-ish size quilt. Once I get there, I can decide if I want to make it bigger or be done. Now back to auditioning fabric. =) I can't wait to get started! Your hexie wallhanging is beautiful! Love the little lamb in the center! 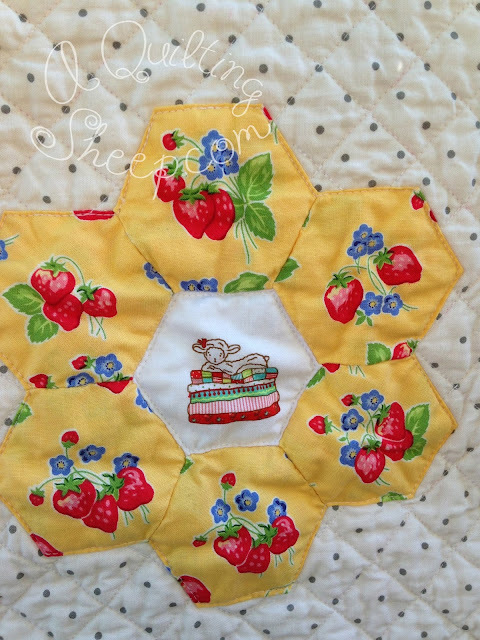 I am looking forward to seeing your progress with the larger hexie quilt! I love doing hexie quilts, and I have one in progress right now with the diamond shapes too! Beautiful! Hexagons are so addicting :). Have fun! Amy you do such beautiful work! I love your hexie quilt. Congratulations on finishing it. Lovely, I have been had hexies and dresden's on my mind all weekend, I am thinking pillows to start! Have a great week Amy!! I love the quilt you are fixin to start!! And you are so lucky to have a math man lol! Will you piece it all by hand? I love the lamb! Where did you find fabric like this? So perfect for you. Love the wall hanging. What size are the hexies you made? I can't see myself doing the tiny ones I've seen. But this looks about like the size I could try. Thanks for sharing this. So lovely. Love your hexie quilt. You must really like doing hexies with your next project...Wow. That's a lot of little pieces. 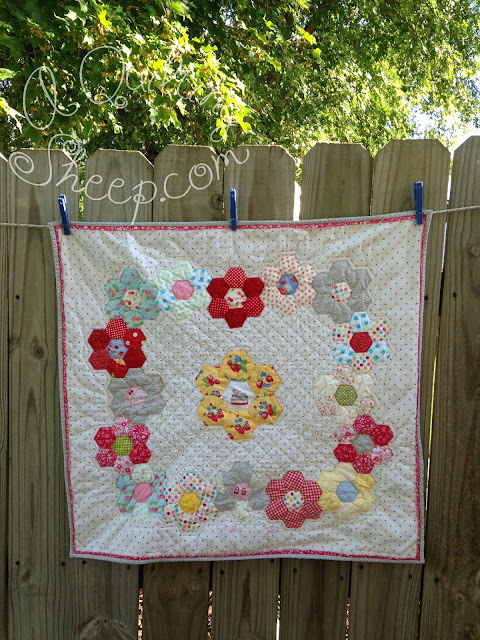 Your hexie flower wall hanging is absolutely gorgeous! I want to make one! I do have some little Hexies sewn I guess I should do something with them. You've inspired me. It's beautiful! I love the polka dots too! Is the fabric you're auditioning Paris Flea Market? It's one of my favorite collections of all times!! Can't wait to see your hexies in it. I love this arrangement. I've had about 16 GFG blocks made from some historic repro fabric made for several months now and couldn't think of a unique layout. I think yours is to be copied! It's wonderful. Thanks for such a lovely quilt. So happy!